Assam Chief Minister Sarbananda Sonowal on Friday said women are forces to dispel darkness. 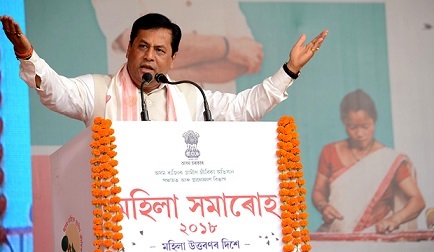 Speaking at the Mahila Samaroh in Golaghat, Sonowal said, “When darkness descends on the society, it is the women who appear as a saviour and illuminate the society by wisdom. Since women are the creators they are the precursors of a true and just society”. Chief Minister Sonowal said under Kanaklata Mahila Sabalikaran Achoni Rs 25,000 are given to each women self help group. He also urged upon the women of the state to take active role in the economy of the state and stated that the sectors like agriculture, horticulture, sericulture can witness huge growth through women participation. Referring to Chief Minister and his delegation’s recent tour to Vietnam where 18 ideal farmers also accompanied, Sonowal said that the exposure tour helped the farmers to gain knowledge on agricultural practices based science and technology. He also asked the women SHGs to gain knowledge from the farmers and work accordingly to bring about their economic empowerment. Chief Minister Sonowal also said state government has adopted several schemes for women empowerment. He also said that for the protection of dignity of women, state government is setting up fast track courts in the state to bring criminals to book. He also asked the women to take a lead role to remove superstitions of all sorts and help the society to come out of the scourge of superstitions.